A crate is a safe, secure area for your puppy to be, when you can’t give him your full attention. It can help speed-up house training. It’s somewhere for your puppy to go when he needs time out. It’s a secure den for your puppy to retreat to, safe in the knowledge that he can relax and won’t be disturbed. (You should ensure children and other pets leave puppy alone when he is in it.). Ideal to use for those breaks away, it’s familiar to puppy and the holiday home is safe from your puppy! 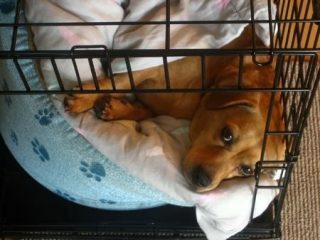 The crate needs to be as comfortable and inviting as possible for your puppy to build up positive associations with it. Put a soft towel or vet bed in the base, both easily cleaned. Always have fresh water available and place a couple of safe toys in the crate; a stuffed Kong is useful. Do this several times during the day. Feed him his meals in the crate. Stuff a Kong with tasty treats and put that towards the back of the crate, if he is comfortable at this stage, you can push the door to. Stay around at this stage and try to ignore what he is doing, so he doesn’t think it is a big deal. Depending on how comfortable your puppy is at the above stage, you can begin to close the door for short periods at a time. Always ensure puppy has been toileted before, so you know he won’t need to go out for a little while. It’s also a good idea to have a little game with him first, so he is tired. Again use a Kong or put his meal in with him. Begin to go about your day as normal with puppy confined. If he begins to whine or bark, remember to ignore him. Only go back to him when he is quiet. If you go back to him when he is being noisy, he will learn to keep barking for longer and longer periods until you return!